Introducing the DWX-4W Wet Dental Mill, the latest in Roland DG technology that goes beyond dry milling to quickly and precisely cut glass ceramics and composite resins. The DWX-4W produces crowns, bridges, inlays and onlays, and veneers at high-speed with its Jaeger DentaDrive spindle and simultaneous 4-axis milling and offers unattended milling convenience and increased efficiency with the option of loading up to three standard pin-type blocks at a time. Featuring Roland DG's famous reliability and product support, it's the ultimate in affordable and dependable milling technology. In addition to milling on X, Y and Z axes, the DWX-4W rotates pin-type blocks 360 degrees on a fourth axis (A axis) to support undercuts. The ball screw-driven 4-axis control allows for smooth, high-precision machining. The DWX-4W's high-performance 60,000-RPM Jaeger spindle is known for its reliability and supports precision milling of glass ceramics and composite resin. 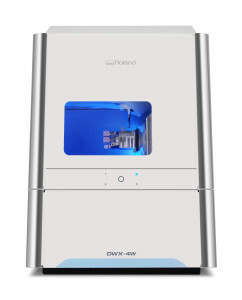 With its multi-pin clamp, the DWX-4W is a wet dental milling machine that can mill up to three different pin-type materials continuously in one operation. As a result, prosthetics for up to three different patients can be produced in a single production run, saving time, labor and costs. The DWX-4W is designed so that even novice users can quickly and easily begin creating precision prosthetics. The workflow is simple: after installing the material and milling tools into the machine, lab technicians use the Virtual Machine Panel (VPanel) to configure settings from their computer and operate the automatic machine calibration to ensure machine accuracy, then automatically send CAM data to the DWX-4W to begin production. Users receive e-mail notifications detailing any errors, or when milling is completed, while color-coded LED status lights inform the user of current progress.